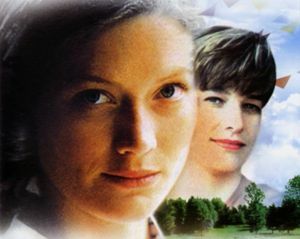 In a sleepy English village, happily married mother of three Alice Jordan (Sophie Ward) feels somehow incomplete, despite her idyllic existence. She finds satisfaction and the love she seeks in the arms of Clodagh (Kerry Fox), a member of the local gentry. The two women embark on a passionate physical affair which threatens to rock the complacent community which surrounds them. Adapted by Alma Cullen from the bestselling novel by Joanna Trollope. Alice Jordan: SOPHIE WARD; Clodagh Unwin: KERRY FOX; Martin Jordan: NATHANIEL PARKER; Anthony Jordan: JEREMY NORTHAM; Sir Ralph Unwin: MICHAEL GOUGH; Cecily Jordan: CLAIRE BLOOM; Lady Unwin: BARBARA JEFFORD; Peter Morris: PETER JEFFREY; Lettice Deverel: ROSALIE CRUTCHLEY; Richard Jordan: PHILIP VOSS; Elizabeth Meadows: HEATHER CANNING; Juliet Dunne: DARIEL PERTWEE; Gwen: LINDA BASSETT; Michelle: SOPHIE WALKER; Mrs Finch: SANDRA VOE.